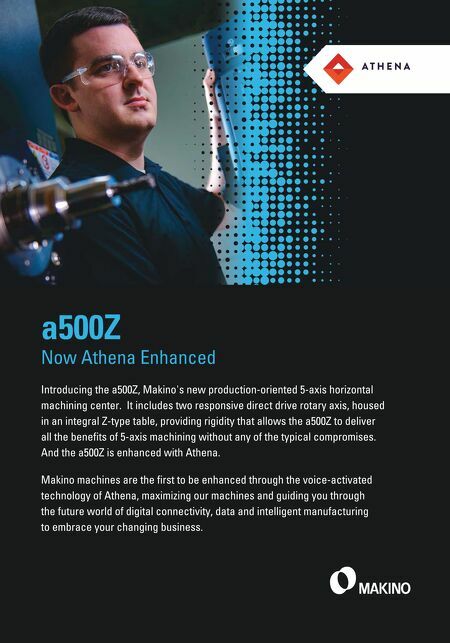 ADDITIVE INSIGHTS MMS OCTOBER 2018 40 mmsonline.com Understanding Industrial 3D Printing Why Is My Surface So Rough? TIMOTHY W. SIMPSON | COLUMNIST Be aware of the inherent manufacturing and design challenges that impact the dimensions and tolerances that you can (or cannot) achieve on an "as-built" part. Designers spend countless hours per- fecting the curves and contours of 3D models in CAD for both aesthetic and functional reasons. Unfortunately, if you have ever 3D printed anything, you know that the geometry you print will not be the same as the CAD model. Why is that? First, most 3D models need to be exported as STL files from their native CAD software in order to be read into build-preparation software such as Mate- rialise Magics and Autodesk Netfabb before additive manufacturing (AM) can take place. During this file export, the 3D model's edges, contours, curved surfaces and more are approximated by a bunch of triangles in a process called tessellation. So, circles are not perfect circles any- more; they are approximations formed by a series of straight lines—the edges of the triangles used in the tessellation (see Figure 1). So why not make the triangles smaller to improve the approximation? You can, but it increases the likelihood of errors in the STL file. Errors can occur from numerical precision, round- o‹ error, misaligned vertices and more. Most STL files have to be checked and fixed before preparing them for 3D printing. Also, as the triangles get smaller, the file size will quickly grow into the GB range, especially for complex, organic shapes and lattices, making the build process slow. 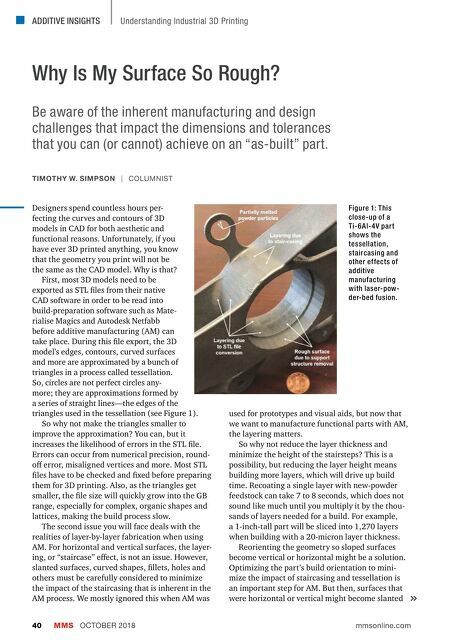 The second issue you will face deals with the realities of layer-by-layer fabrication when using AM. For horizontal and vertical surfaces, the layer- ing, or "staircase" e‹ect, is not an issue. However, slanted surfaces, curved shapes, fillets, holes and others must be carefully considered to minimize the impact of the staircasing that is inherent in the AM process. We mostly ignored this when AM was used for prototypes and visual aids, but now that we want to manufacture functional parts with AM, the layering matters. So why not reduce the layer thickness and minimize the height of the stairsteps? This is a possibility, but reducing the layer height means building more layers, which will drive up build time. Recoating a single layer with new-powder feedstock can take 7 to 8 seconds, which does not sound like much until you multiply it by the thou- sands of layers needed for a build. For example, a 1-inch-tall part will be sliced into 1,270 layers when building with a 20-micron layer thickness. Reorienting the geometry so sloped surfaces become vertical or horizontal might be a solution. Optimizing the part's build orientation to mini- mize the impact of staircasing and tessellation is an important step for AM. But then, surfaces that were horizontal or vertical might become slanted Figure 1: This close-up of a Ti-6Al-4V par t shows the tessellation, staircasing and other ef fects of additive manufacturing with laser-pow- der-bed fusion.